My fourth stadium of 2012 was on Saturday 18th February 2012 at Gorings Mead in Horsham, West Sussex. 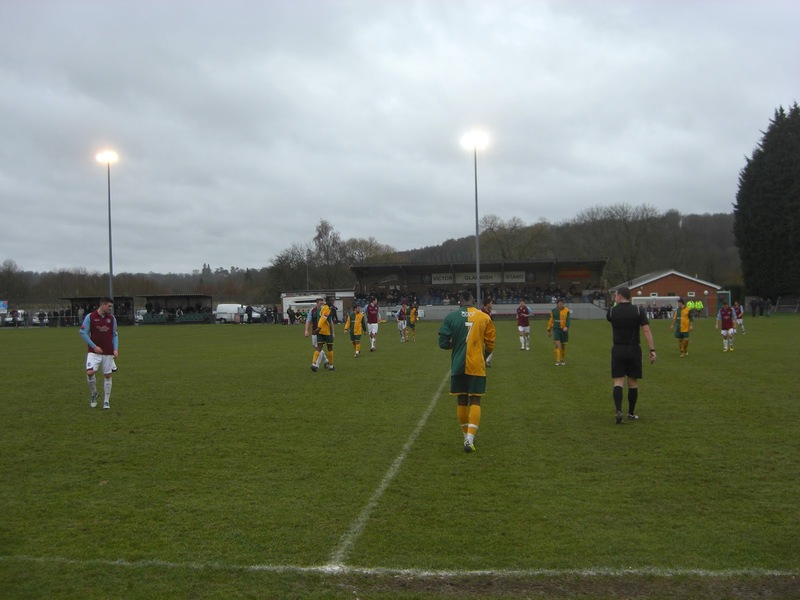 The match was Horsham vs. Hastings United in the Ryman Isthmian League Premier Division. Gorings Mead is located in a residential area close to the town centre. Horsham railway station is just under a mile from the venue. 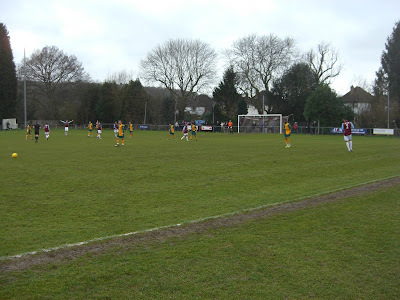 The ground has been home to Horsham since 2009 as their former Queen Street ground was sold to housing developers. The club initially groundshared at Worthing before moving back to Horsham to Gorings Mead which sits adjacent to their old Queen Street ground. The main stand in the ground is the Victor Gladwish Stand which is positioned level with the half-way line on the south side of the ground. 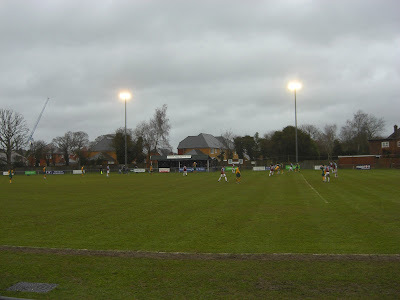 This stand has around 200 seats although as it sits behind one of the floodlights, the views are slightly interrupted. The two dugouts are on either side of the stand with the players dressing rooms also directly next to the stand. Two additional stands are also placed on the south side of the ground - both are small metal structures with one all-seater stand capable of holding 50 fans and one all-standing structure. Opposite the two small stands on the west side of the ground is a larger covered terrace section. The remainder of the stadium is uncovered standing behind the metal barrier which separates the pitch from the fans. 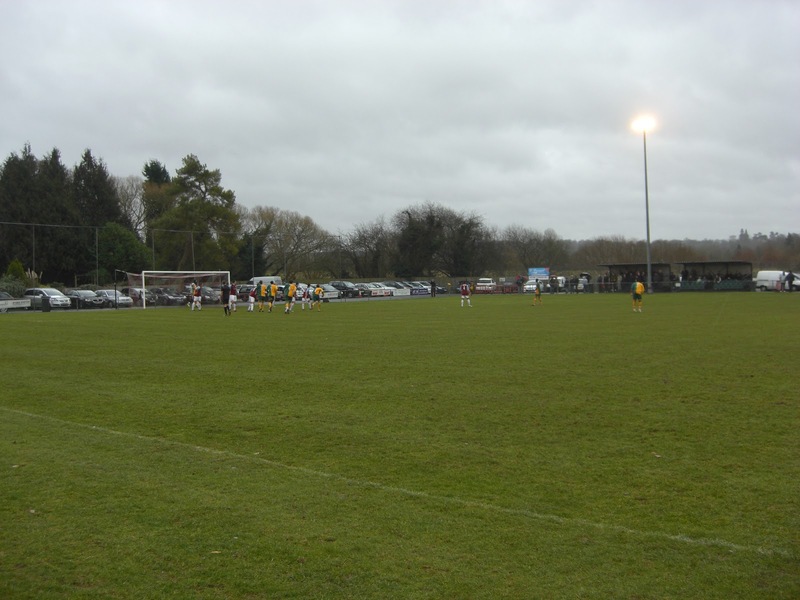 The areas behind the two goals are rather narrow with the west side of the venue backing onto housing and the area behind the goal at the eastern end of the ground dedicated to a small car park. The game started brightly for the home side as they took an early lead in the 3rd minute when a corner was crossed into the box and rifled into the top corner. Hastings came back into the game shortly after and had several chances to draw level with long balls over the top continuing to bypass the Horsham defence. Eventually in the 31st minute one of these chances was taken when Horsham failed to deal with another ball over the top leaving Hastings to score from close range. Just before the break the away side took the lead when they got into the Horsham box and after a bit of a scramble shot into the roof of the net. An entertaining first half was followed by an uneventful second period. Hastings looked to have more quality than a Horsham side who coming into the match had won just two games all season and the visitors were able to hang on to record a 2-1 victory.